A couple of years ago some video stores around began to secure their membership cards from misuse. The security measure consists of a PIN the user has to type into a keypad. At least the operators thought it is a security measure. I, for one, don’t believe that anymore since the day I forgot my PIN. I suggested to authenticate myself with the official German identity card (Personalausweis) but the store clerk rejected that idea. Instead, he let me choose a new PIN. I chose one that is easy to remember since it obviously doesn’t matter which one to choose: 1111. 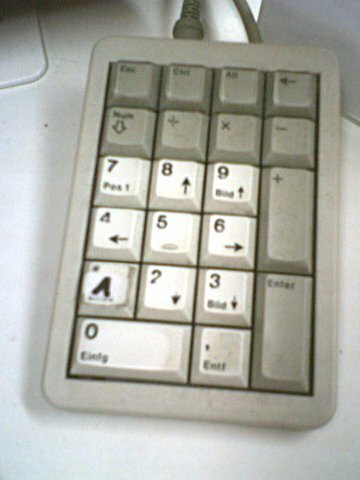 Below is an image of the keypad after a couple years of use. I guess I’m not the only one with this PIN. This entry was posted on Monday, September 12th, 2005 at 10.44 pm	and is filed under Dies und das. You can follow any responses to this entry through the RSS 2.0 feed. Both comments and pings are currently closed.